Wouldn't you love to attract new members who are excited about being involved? People are engaged with brands online, and old antiquated ways of communicating won't work. I'm going to list a few basics that your organization needs to be actively doing if you want to stay relevant and reach new members. For your business, it’s about the quality of content and what your audience should come to expect from your Facebook Business Page. Remember that being overly promotional can have its downside. According to the Sprout Social Q3 2016 Index, 57.5% of social media users said posting too many promotions was the most annoying action from brands. Use your Facebook Business Page for highlighting events and stories. This is where you post a selection of your BEST articles, BEST photographs, and share related news. Ideally, creating an article on your website and sharing the link on your facebook page will give you better results. Every organization needs a separate Facebook group to share information that isn't right for the Facebook Business Page. Some conversations should be kept within the private group. Create a separate Facebook Group to discuss internal business between members and officers, like recruiting tactics, asking questions, and congratulations for making milestones. You can invite group members to post photos and recaps of their events so that you can choose what would be great content for the Facebook Business Page. Make sure your branding is consistent on all social media channels. Use the same logo and colors so that it is easily recognized when people are scrolling through their posts. Use only your organizations approved Logo as your profile image on your Facebook Business Page and other social media channels. Educate your readers about what you’ve been doing recently to make lives better, and how they can get involved. What are their values, hopes, and dreams, interests? What would inspire them to get involved? What action do you want your website visitors to take? Your content will document your organization's history in a story that continues to be told. Use your website to connect and engage with the local community so others can share your stories across all social media networks. If you've met with someone eligible to be a member, pull up your own local post's website and have a conversation about why you love being involved and show them recaps of past events and photos from your website. Having great content available to share is more compelling, entertaining, and helpful when you're inviting a new member. You can even click on the join link and sign them up online. Planning content ahead of time helps produce higher quality posts. Looking through your calendar of upcoming events can help you decide on topics rather than hastily posting something for the sake of publishing content. Create a social media calendar to plan content you can set up to post across all networks and build your content for weeks in advance. For every event, designate someone in your organization to write a recap to go on your blog and get some good photos to go with it. THEN share the link on Facebook. It's okay to post some things directly to Facebook, but don't neglect the website. People can share the link from your website over and over. Plus, it builds credibility when someone visits your site and sees real stories. Your website is more than a place to post reports. A potential new member probably won't understand or care about reports. Fresh content about what you've done recently will make a bigger impact on getting them involved. It will increase membership and engagement! VSODM (Veteran Service Organization Digital Media) is a project of Tovani Design created to help VSO's build a stronger web presence. I want to answer questions and offer training to Officers and Chairman og VSO's so they can add this benefit to their organization. Too often, I meet members who can barely use email, and logging on to facebook is the extent of their ability to utilize the internet. It is very important to be current with technology. There was a time when we used horses and buggies, and we didn't have telephones or electricity. Does anyone even use a typewriter anymore? My point is, if you're going to be in a position that requires certain skills, you need to have those skills! Even though if may seem intimidating, I promise you, it's not that difficult. All you need is the willingness to learn. This project will evaluate what skills can be taught and reproduced for each set of new officers annually. While volunteers are not necessarily required to have these skills, it severely holds them back from reaching their potential audience. Each year, with the incoming new leadership, there is no official "Onboarding" strategy sufficient to get them on their way successfully with online tools and resources. I am a Life Member of VFW Auxiliary in California. 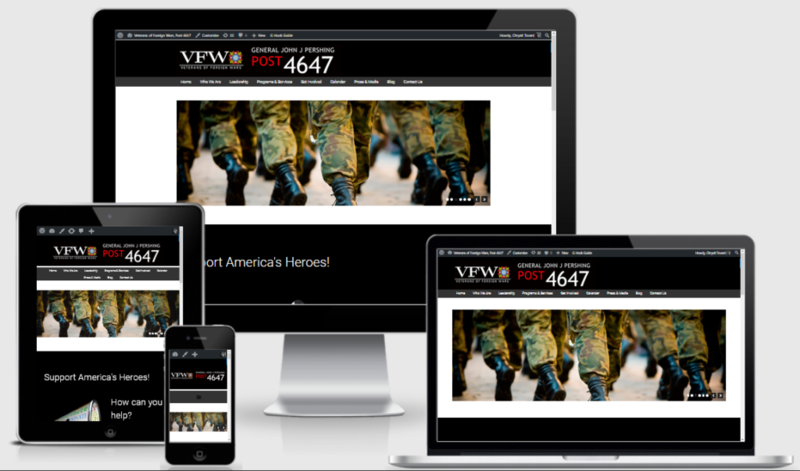 I was the newsletter editor at VFW Post 4647 for 15 years and built one of the first VFW Post websites. When I took over the newsletter it had been typed on a typewriter and literally cut with scissors and pasted with glue to a larger sheet of paper before being run through a copier. Getting news out consisted of posting a message on the bulletin board in the hall. Fortunately, I had the support of the Officers from our post and freedom to be innovative. I had the honor and pleasure of working along with my mentor and friend, Al Griffith. Al was the Quartermaster, for many years at VFW Post 4647. In 2008, I was applying for a position with the Department of Veteran Affairs and asked Al to write a letter of reference for me. He didn't hesitate and described how I brought our VFW Post 4647 "kicking and screaming into the computer age." I had to share it. Al always introduced me to new members saying, "This is Chrysti. She is your friend." He passed away a few years ago. He is loved and remembered well. Organizations gain popularity when they resonate with Gen-C (the connected generation). I'm dedicated to Veteran Service Organizations, particularly the VFW, that want to thrive by inspiring people to be involved. I have training available for new officers and there are training videos in the dashboard of my websites to get started. I work with Veteran Service Organizations that need help telling their stories and getting more donations and volunteers so that they can assist our men and women in the military who rely on their support. Now, more than ever, it's important to use the tools available, correctly, to get your message to the right audience. Veterans are in need of services and we need volunteers to joining to help. Arm your Officers with all the right mix of skills they need to boost social engagement to attract new members and volunteers on various distribution channels. Onboarding new Officers and Chairman is essential to keeping consistent branding and tone for your organization's web presence. It can mean life or death for your marketing results. Hire me for your next event or workshop. I have a series of "Five Things You Need to Know" pieces of training. Techniques to write good copy to improve the effectiveness of communication when crafting a blog post, Facebook posts, tweets, and Instagram posts. Create visual content with free premium quality graphics. Provide customer service and community engagement on social media channels. Measure performance. Learn how to read and interpret data to see which channels are making the most progress and which are not, so you can plan your marketing and adjust content. Budgeting for paid advertisement and social media management tools. Engagements outside Sacramento, California will include transportation and accommodations, per diem and a one-day minimum fee. Contact me to discuss your specific needs. Level up to one of our predesigned websites made for your organization at a special price. We'll send you a preparation kit and you can book your build.